Join us for our 2nd annual Christmas show! 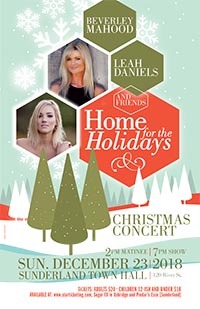 Songs, stories, special guests and a few surprises to celebrate the magic of the holiday season! Perfect for the whole family! All tickets general admission (non-reserved seating) and are: $21.00 for adults and $11.00 for children under 12 and include all taxes and ticket fees.